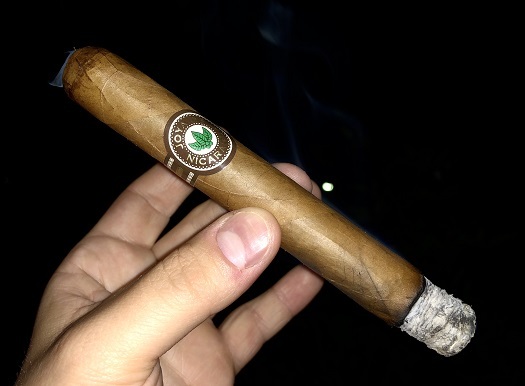 About a month ago, Joya de Nicaragua announced the reintroduction of the Clásico line to the U.S. market. The move to bring back “the first Nicaraguan cigar ever” seems fitting at a time when the company is celebrating its golden anniversary. In a departure from the powerful smokes for which the company is known, Joya is marketing Clásico as “mild” and “creamy.” There are 6 formats, each packaged in 25-count boxes: Churchill (6.9 x 48, $8.50), Toro (6 x 50, $8.15), Consul (4.5 x 52, $7.00), Torpedo (6 x 52, $9.50), Número 6 (6 x 41, $6.50) and Señorita (5.5 x 42, $5.50). The recipe remains the same as it did decades ago. The wrapper is Cuban-seed Ecuadorian Connecticut, and the binder and filler tobaccos are, of course, Nicaraguan. I sampled the Toro for this review. In addition to traditional, understated, and—in my opinion—beautiful bands that nicely highlight the golden color of the smooth, buttery wrapper, this cigar has bright, crisp pre-light notes of sweet hay at the foot. The cap clips cleanly to reveal a smooth cold draw. Once an even light is established, I find a creamy texture and a medium body to the smoke. The flavors include white pepper, oak, and café au lait. Roasted peanut comes to the fore after half an inch; this is the most enjoyable segment of the cigar. About a third of the way in, there is a notable decrease in what was already a soft spice, and the creaminess ramps up. The profile teeters between mild and medium once you reach the halfway mark. Here, the roasted peanut is now a creamier peanut, and the former base of white pepper and oak is mostly oak. At times, I can pick up hints of melon. The finale is mellower than I expected. There is no spice, and the overall taste is somewhat papery with a subdued creaminess. As a result, I found myself setting the cigar down earlier than I do with most smokes. The construction is in line with the standards that are characteristic of Joya de Nicaragua: straight burn, smooth draw, sturdy ash, and voluminous smoke production. I enjoy mild cigars, but mild cigars need to have flavor. The Clásico Toro has flavor. At times it shines, and at times—especially the final third—it falls a little short. I’m going to try the other sizes to see if this is true across the board, or if other formats behave differently in this regard. For now, I’m awarding the Joya de Nicaragua Clásico Toro three stogies out of five.